It all started when I was trying to think of a Valentine's Day recipe to make last week. My greatest setback was that I loath the combination of fruit and chocolate (chocolate covered strawberries being the only exception). However, I was determined to find a way to combine the two. This is where Scott comes into the picture, my fruit-and-chocolate-loving-husband. His favorite combination being raspberries and chocolate - I decided to oblige his taste buds, but with a twist of my own. Peanut butter. I can never go wrong with peanut butter. I eat jars of the stuff homemade every week. Therefore, I knew if I put that golden goodness in the recipe somehow I would be sure to love it regardless of my disdain for the deadly fruit and chocolate combo. The verdict? It was a hit for both fruit and chocolate lovers and haters alike. 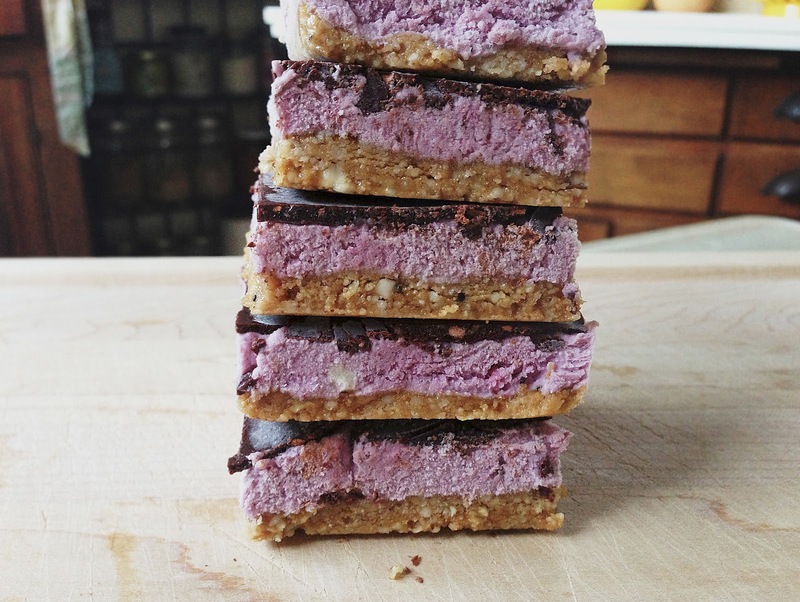 How can you not love an ice cream bar that tastes like peanut butter and jelly? (Unless you don't like peanut butter and jelly. In which case you have bigger problems to deal with.) Needless to say, I got distracted and Valentine's Day came and went without a blog post on this recipe triumph, but here is the recipe to enjoy year round nonetheless. *I chose to use walnuts in the crust with the cashews, however, feel free to use all cashews or another one of your favorite nuts instead. 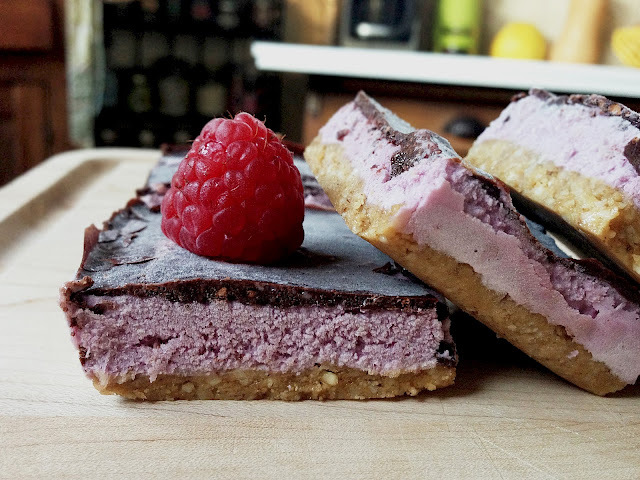 **Use raw peanut butter to make this dessert 100% raw. If using unsalted peanut butter, I recommend adding a 1/4 teaspoon of salt to the crust ingredients. Begin by lining an 8x8 inch baking pan with parchment paper and set aside. To make the crust, process the nuts in a food processor until they resemble a coarse meal, then add in the peanut butter and honey/agave. Process until well mixed (should be a sticky batter). Press the crust mixture evenly into the prepared pan. Prepare the raspberry ice cream layer by combining all of the ingredients listed above in a food processor. Process until smooth and creamy, and spread evenly over the crust. 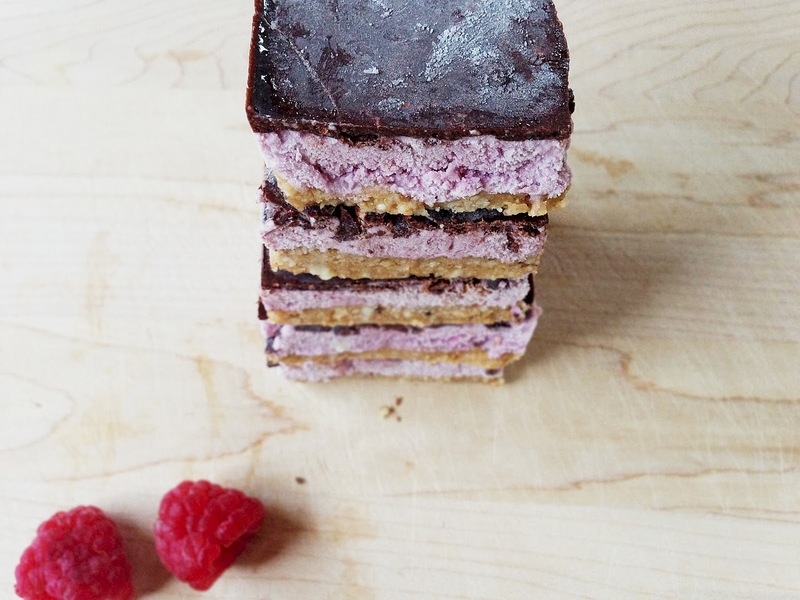 Whisk the chocolate layer ingredients together until smooth, and pour over the top of the raspberry layer. Place the pan in the freezer, and freeze for at least 1 hour before slicing into squares. Keep the ice cream squares in an airtight container in the freezer until ready to serve. I'm trying this next weekend! Think the crust would still hold together if I did not put the peanut butter in the recipe? Thanks for your passion and sharing of these fantastic recipes! Thank you so much! So sweet of you to say, I'm glad to share! As for the peanut butter, I would highly recommend using it (or cashew butter, almond butter, etc.) But if you can't or don't want to, you'll need to substitute another wet ingredient. I'd recommend 4 or 5 chopped dates and a few teaspoons of water (add one at a time until sticky)! Hope this helps! Can you use Tahini instead??? Hi can I feature this recipe? Please email me kathy (at) lunchboxbunch dot com - thx!! Wow, looks satisfying in every way! Thanks Jessie! Hi there. The current Food on Friday on Carole's Chatter is collecting links to posts about ice cream and sorbets – or anything similar like gelato. I do hope you link this in. This is the link . Please do check out some of the other links – there are a lot of good ones already. Have a great week.